When we talk about intimacy with the Lord and daily walking with Him, one of the issues we must always face is that of God’s will. We speak of wanting to be ‘under His will’, or of casting ourselves on Him in faith ‘that His will be done’. I didn’t get the job I applied for? Must not have been God’s will. She said “no,” despite the fact that I proposed marriage using multi-colored sky writing? Must not have been God’s will. 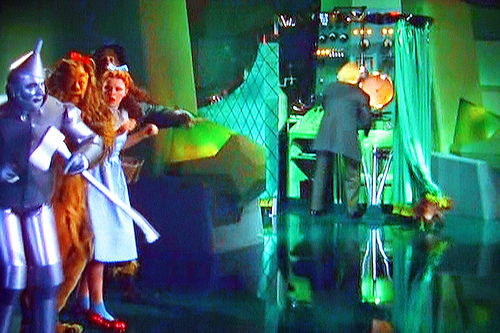 We can see the problem here: it turns divine will into simple fate, and God becomes the Wizard of Oz – some guy with questionable intentions who’s invisible behind a screen, pulling levers we can’t even understand. Now there are lots of reasons why this is an incorrect view of God and His will, and maybe we’ll get into those later. But what interests us right now is the connection between God’s will and our will, the things we want to happen, and how we try to understand the relationship between what we want and what God wants. Again, I’m not interested right now in what’s right or wrong about these perspectives and I admit to sharpening them up a bit for the sake of argument. What’s important now is to see what these perspectives do to us, to our ideas about life and the plans we make. In the extreme Calvinist view, there’s basically no point in planning or wishing or hoping for anything in this life. If life is a plate of ashes and woe, then great! Or if everything I touch turns to gold, then great! That’s what the all-sovereign Lord as given me, and I’ll dig in. I don’t need to dream or plan for anything, because it couldn’t possibly change the course of my life. So I distrust anything of my own invention, because the Lord’s will is going to trump it all, anyway. At the other end, ‘my best life now’ is all up to me: all I need to do all day is think about how much more awesome my life could be! Bigger house, newer car, thinner television – my Heavenly Father is ready to indulge every desire of my sweet little heart. And I can trust every thought I have, since I’m a royal son of the King, the Lord of the cattle on a thousand hills. Since God’s will is just my will spoken in a louder voice, then I can go through life confident that whatever I plan, the Lord is already ahead of me. Can we see how starting with a particular view of divine will influences how we think about our own human will and the plans we make in life? Surely we can find lots of problems with each of these extremes, but aren’t we all somewhere in between? How can we find a point of healthy balance between God’s will and our will? In my next post, I will offer what I believe is a simple and practical answer to this question. In the mean time, I invite you to leave some feedback here!